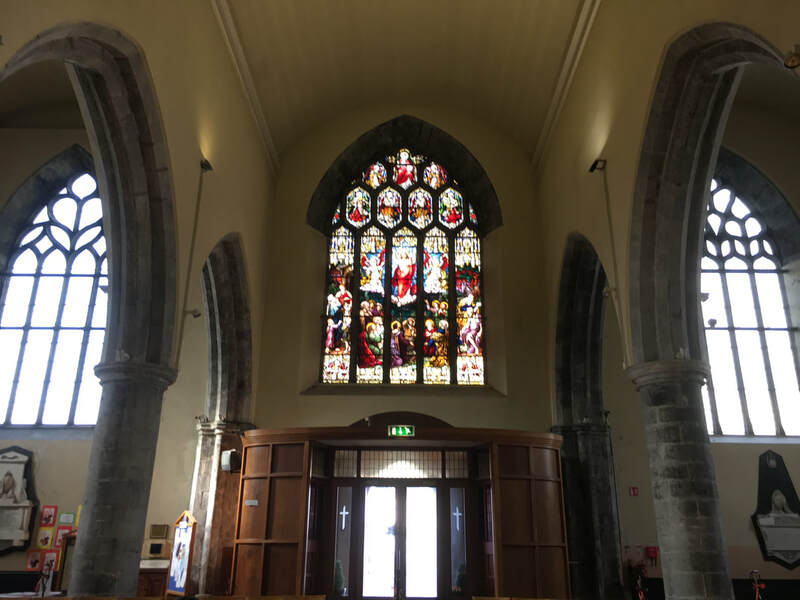 An Mháirt seo chaite, d'ullmhaigh Rang a Trí pancóga. 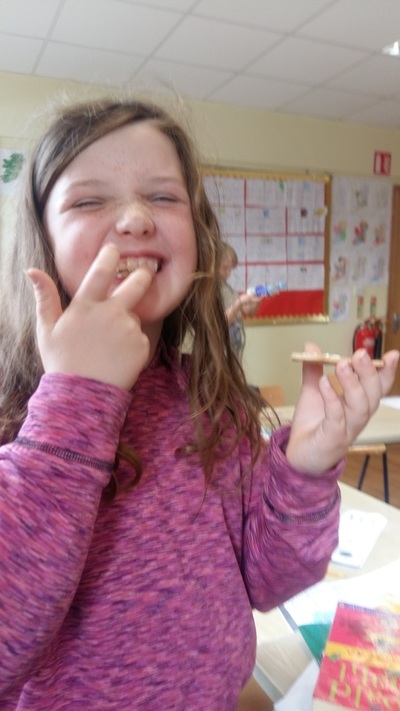 Mheasc siad le chéile plúr, uibheacha, salann, bainne agus ola. 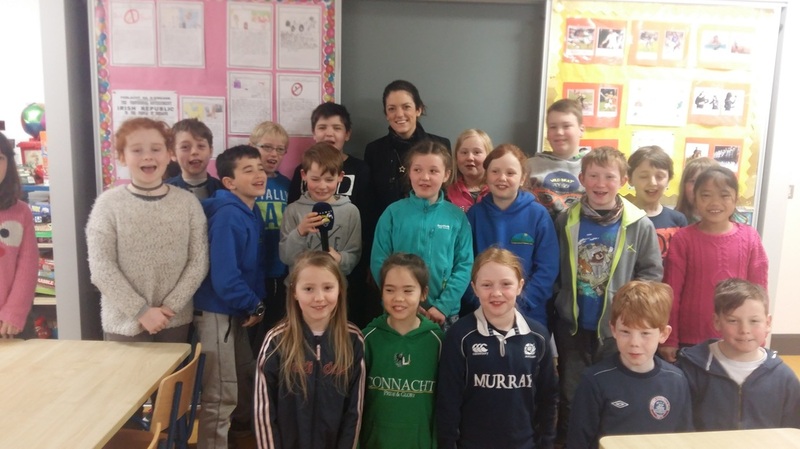 Dhoirt siad beagáinín den mheascán isteach sa fhriochtán a bhí smeartha go héadrom le hola. Rinne siad iad a fhriochadh ar an dá thaobh. 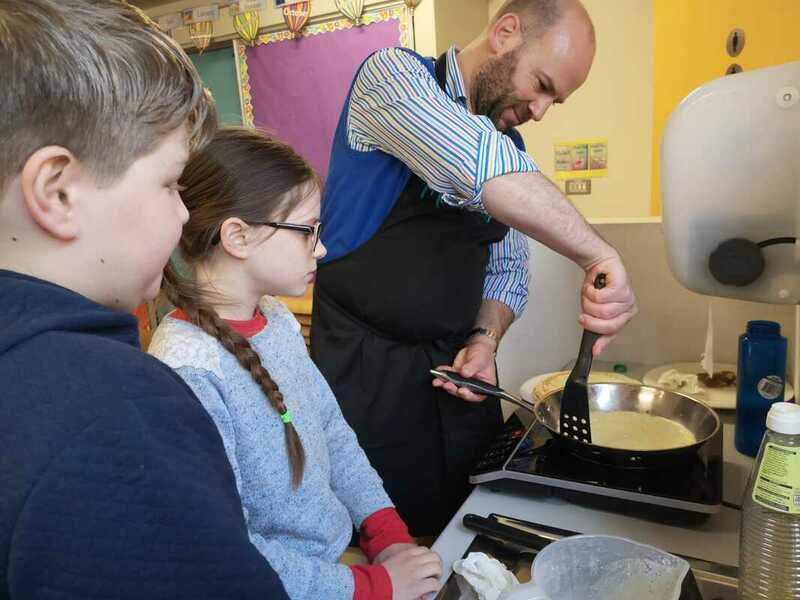 D'ith siad na pancóga le bananaí, le fraocháin agus le mil. Bhí siad go han-bhlasta ar fad! 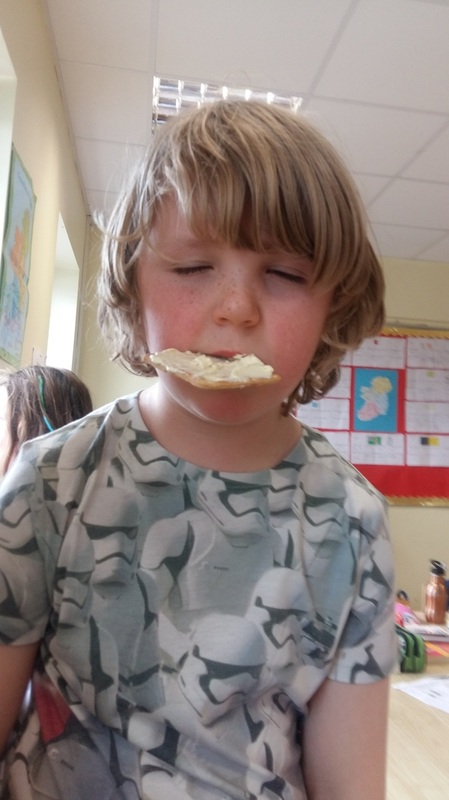 Rang a Trí have been discussing the importance of co-operation in Circle Time recently. 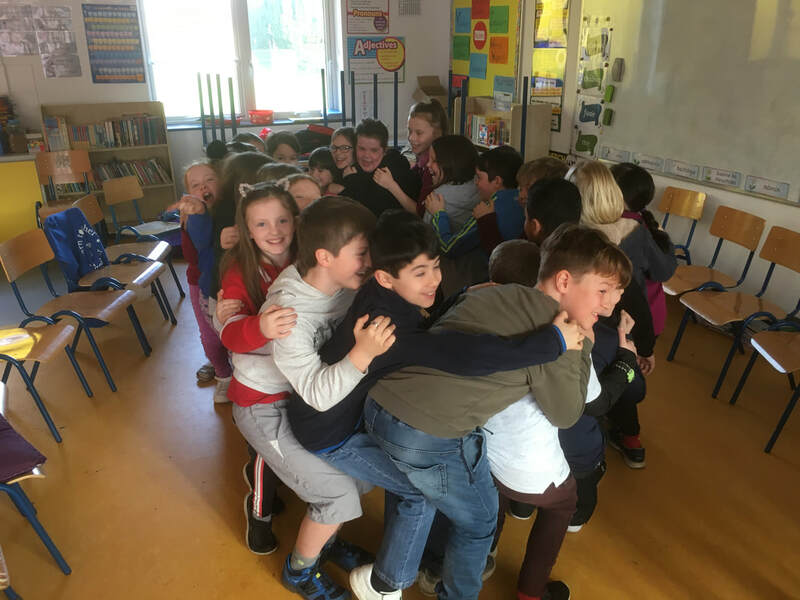 For one of the warm-up activities, we had to work together and trust each other to sit on each others' laps at the same time. The plan worked! On Friday, 1st February, Rang a Trí donned their helmets, hurleys and sliotars to brave the frosty weather and enjoy their first training session with David. After some warm-up activities, David took them through a few basic skills including dribbling and catching. We're already looking forward to next Friday! 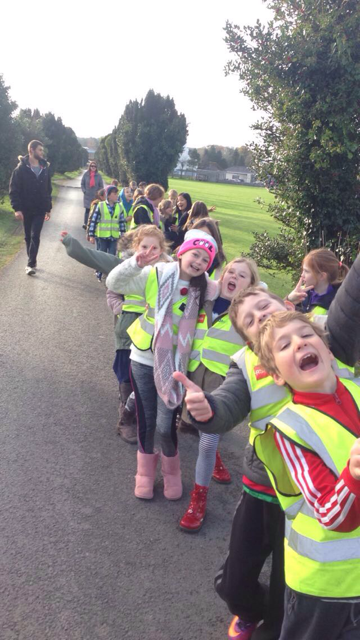 Rang a Trí have been very busy keeping their bodies active recently. Before Christmas, we had lots of dance breaks to help us refocus between subjects. We have been very lucky with the weather since coming back to school in January. On the first Friday back, we completed the planet walk, stopping along our journey to complete different activities. The second week, we teamed up with Naíonáin Shóisearacha for stations in PE with skipping, throwing and catching, bouncing, and using ladder runs. Did we mention that we did all these whilst wearing our pyjamas?! On Tuesday, 16th October 2018 we went on a trip. We went with 4th Class. Some parents came too. We went by bus to Galway. First we went to a shopping centre because it was raining. In the shopping centre, we saw the old city wall. 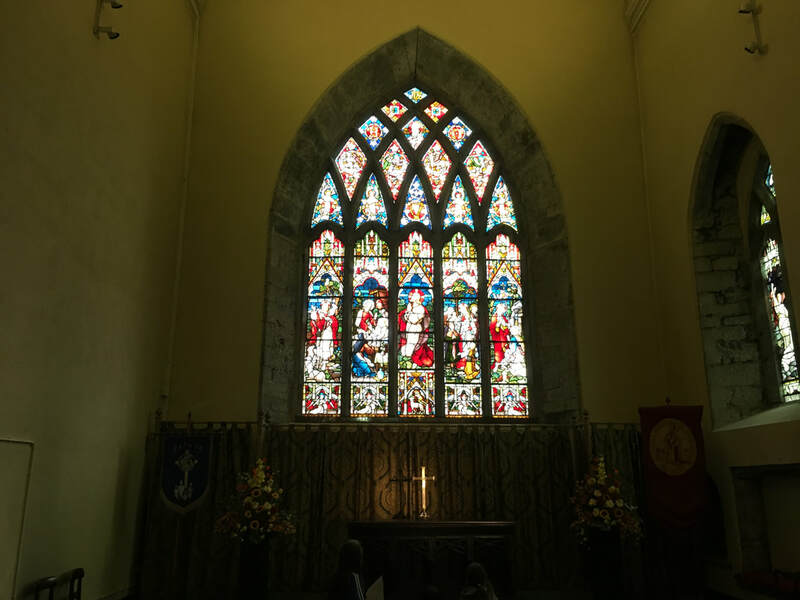 It was made of stone and was very thick with round towers at the corners. 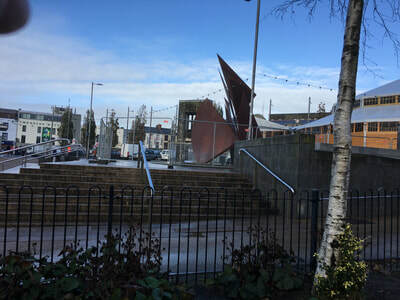 Next we went to Eyre Square. 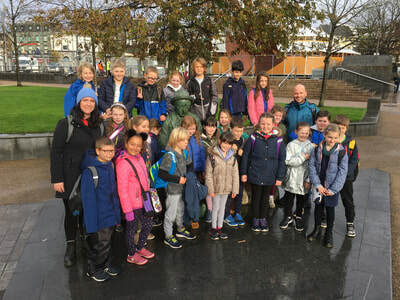 We saw a statue of the poet Pádraig Ó Conaire. We ate some lunch and went to a playground. Then we walked through Shop Street to St Nicholas’s Church. 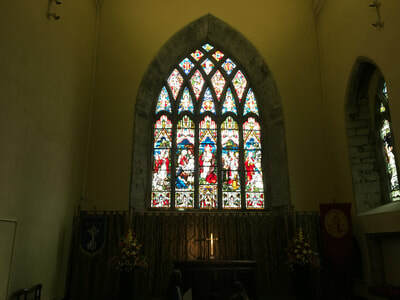 We did a Treasure Trail around the inside of the church building. We learned lots of facts. We saw a statue of a smiling angel. After that we sat beside the canal to eat our lunch. It was then time for Baboró so we walked around to An Taibhdhearc. 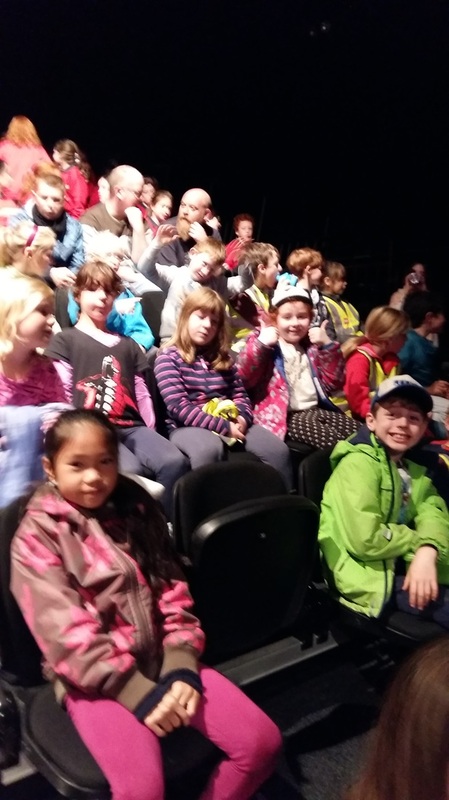 We watched the play ‘Narrow’. It was hilarious. It was about two people living in a box. Sadly it was time to get the bus back to school. We had a fantastic day. 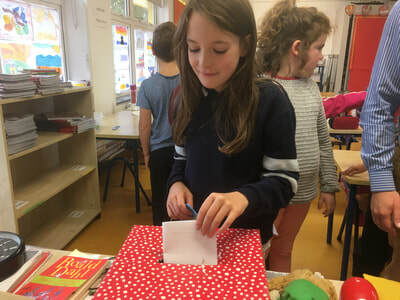 3rd Class held their Student Council Elections last week. This was a great opportunity to learn about the importance of voting, especially with the upcoming Presidential Election. 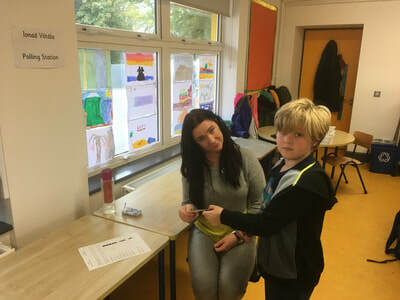 On Polling Day, students had to present their 'identification cards' to the Presiding Officer in order to receive their ballot papers. They then took their papers to a 'polling booth' so they could vote in private, numbering their candidates in order of preference. After a hard-fought campaign with carefully-designed posters and thoughtful speeches, the successful candidates were Erica and Ruairí. Well done all! Welcome to our third class website. We have been up to lots of fun activities since we came back after our Summer Holidays. 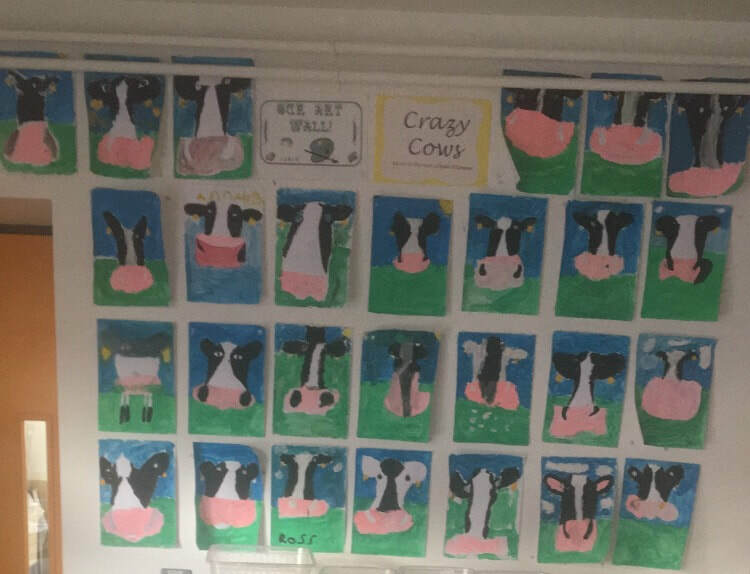 We looked at the art work of Eoin O'Connor and took inspiration from his work and re created our own versions of his famous cow paintings. We had great fun drawing the cows as we had to pretend the cows were looking down the lens of the camera. Take a look at our wonderful creations. 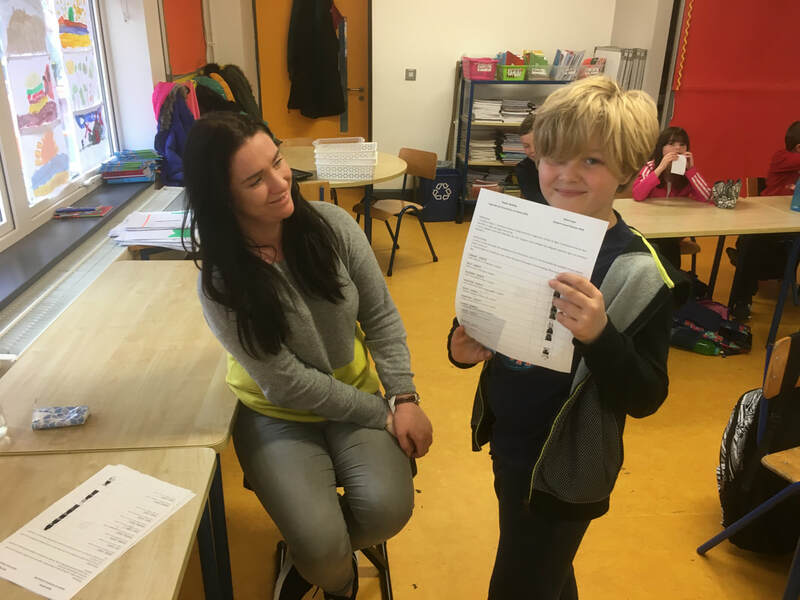 On Friday the 29th of September third class got involved in the Fighting Words Writing Workshop. We had great fun as a class taking part in this workshop. We worked together as a class to think of characters, a setting and a plot for our story. Then we worked in groups or individually to create an ending for our story. It was so much fun. This week we received copies of our book and it even had our pictures at the back. 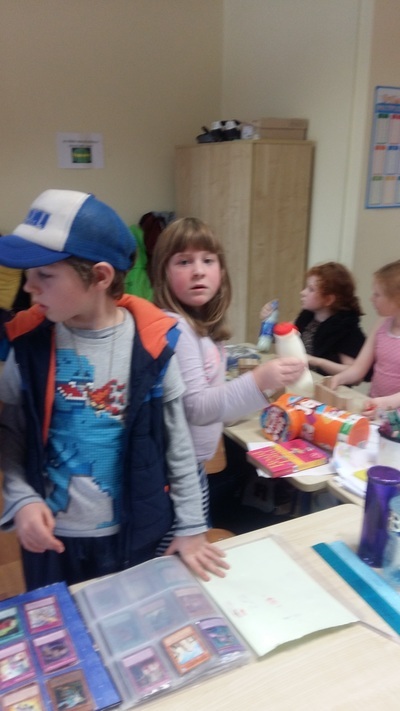 Thank you so much to parents of the school Anna, Fergus and Cathy and to Patsy for organising it. 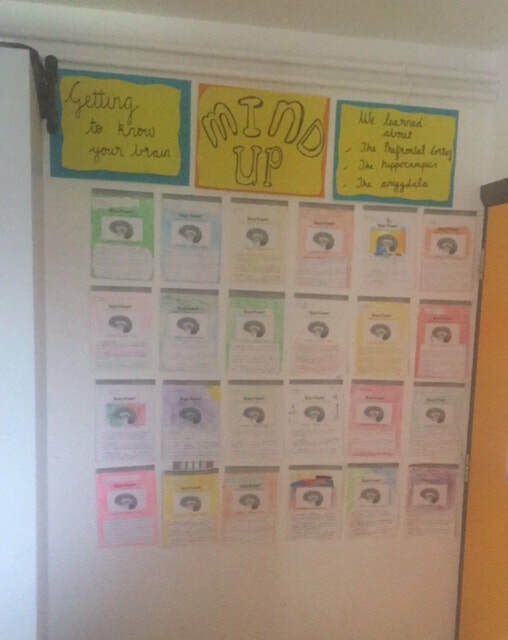 As part of the Mind Up Programme that is being implemented in our school this year we started one of our lessons on learning about the brain. We learned about three important parts of the brain - the prefrontal cortex, the amygdala and the hippocampus. We learned the functions and the locations of these parts of the brain. We worked together to write about these parts of the brain and to describe what they do. We have them displayed at the back of our classroom. 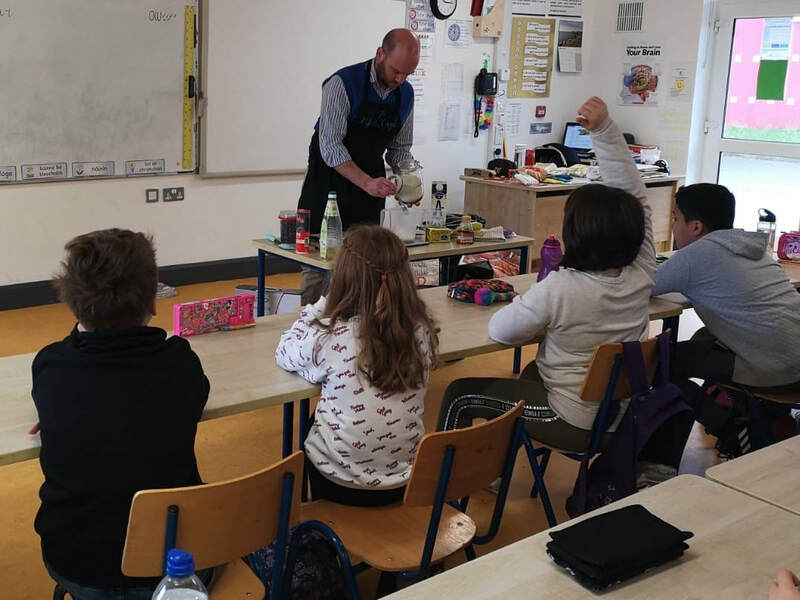 For Engineers week Dara's dad in fourth class came into our class to talk to us about engineering with two of his colleagues. It was really interesting and we also had to make towers out of marshmallows and matchsticks. We worked in groups and had to use our engineering skills. It was really fun! Science - The Bending of Light! We did a lovely activity in class where everybody in third class wrote a nice adjective about everybody. 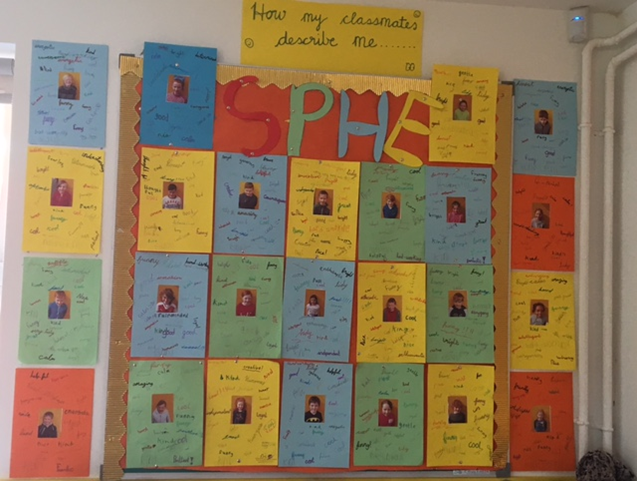 They are on display on our SPHE wall in the classroom! Ruby and Max's Mom, Maeve and Susan came into talk to all the classes about Down Syndrome for Down Syndrome Day. It was really interesting and we really enjoyed it. Thank you very much Maeve, Suzanne, Max and Ruby. 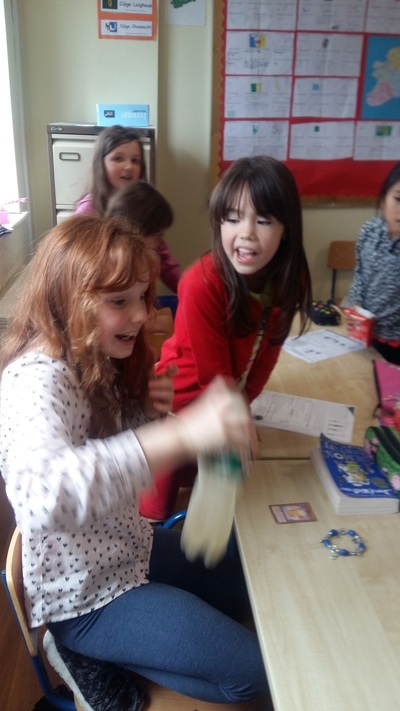 We got up to a lot of activities for Seachtain na Gaeilge. 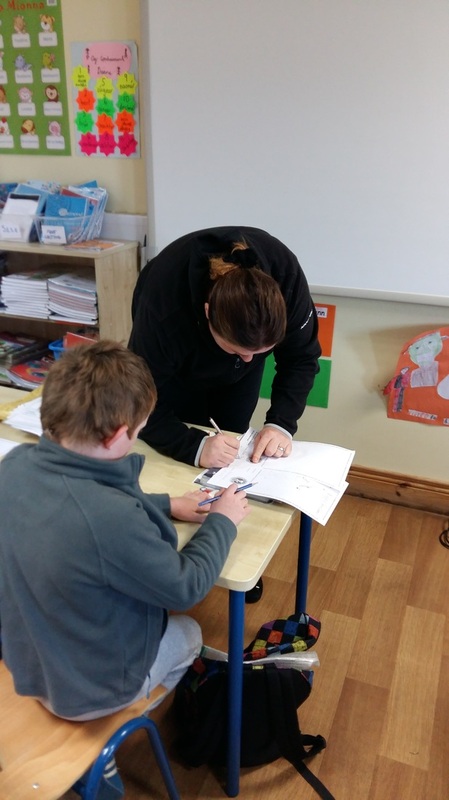 We had an art competition where we had to draw pictures and design poster based on different seanfhocail. It was really fun! Bhain muid an taitneamh as! We also dressed up and had a fashion show. Children wore traditional Irish clothes! It was great fun! Well done to Oisin who won! We also had a Tráth na gCeist with Rang a Dó! Bhí sé go hiontach! 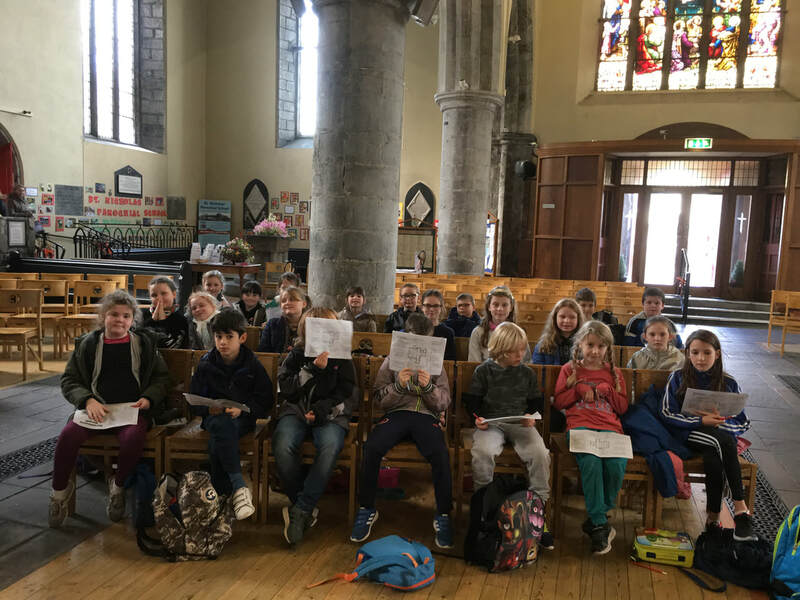 We also did a performance for first and second class where we sang the song Báidín Fhéilimí and Ruairí accompanied us on the guitar! Ruairí was great on the guitar and the children sang beautifully. 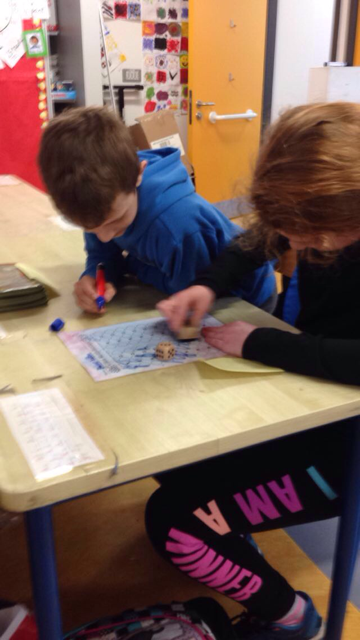 For Maths Week Third Class got involved in a number of maths activities. 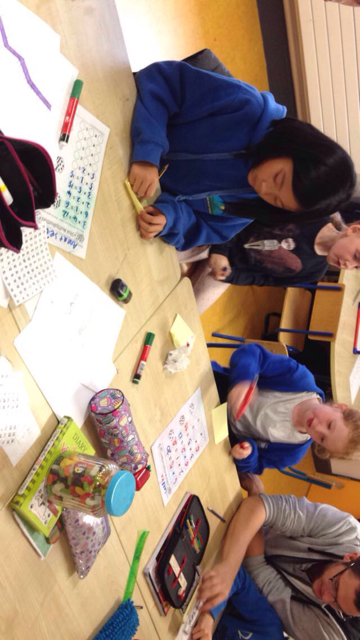 We played maths games in the classroom and we also had a maths challenge. The children had to estimate how many jelly beans were in a jar, the person who came closest to guessing the correct amount won the jar of sweets! It was a lot of fun estimating how many sweets were in the jar. ​We decided to take a winter walk through the woods near our school. We had a lovely time and we were looking out for all the signs of winter in the woods. ​Some of the boys and girls dressed up for Hallowe'en! We had a great day in the class with everyone dressed up in different costumes!. 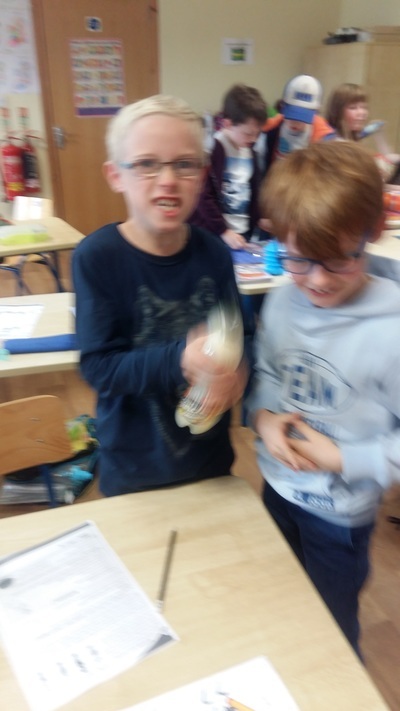 ​In science we conducted an experiment with fresh water and salty water. 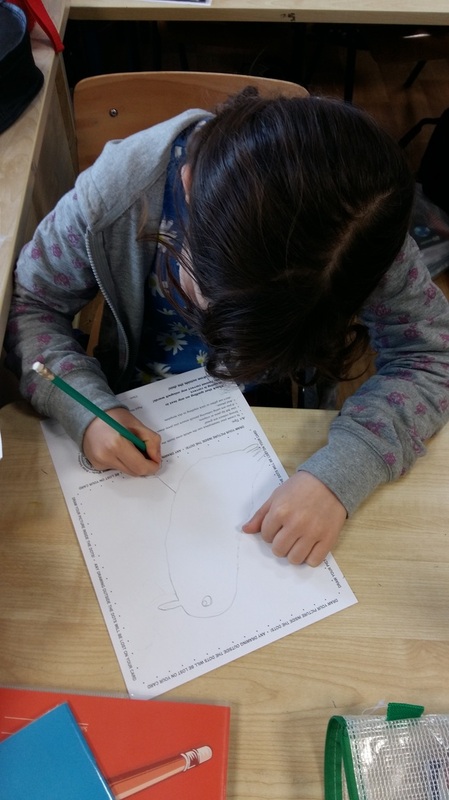 ​We used eggs and we predicted in which water would the egg float in, salty water or freshwater. We worked in groups and put water into a glass jar and put water and salt into another glass jar and stirred it. 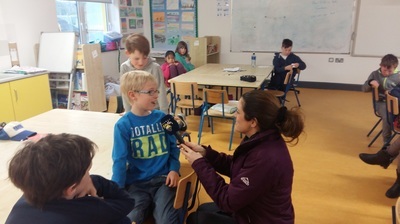 Lyndsay Hughes from Galway Bay FM interviewed the children about their experience taking part in the Write a Book competition. 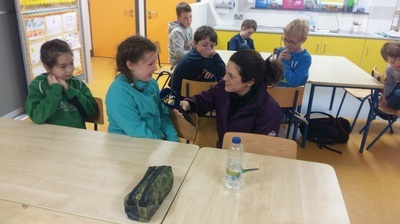 We were broadcast on Monday at 5pm on Galway Bay Fm! Practicing G.A.A skills with Darren a local coach. 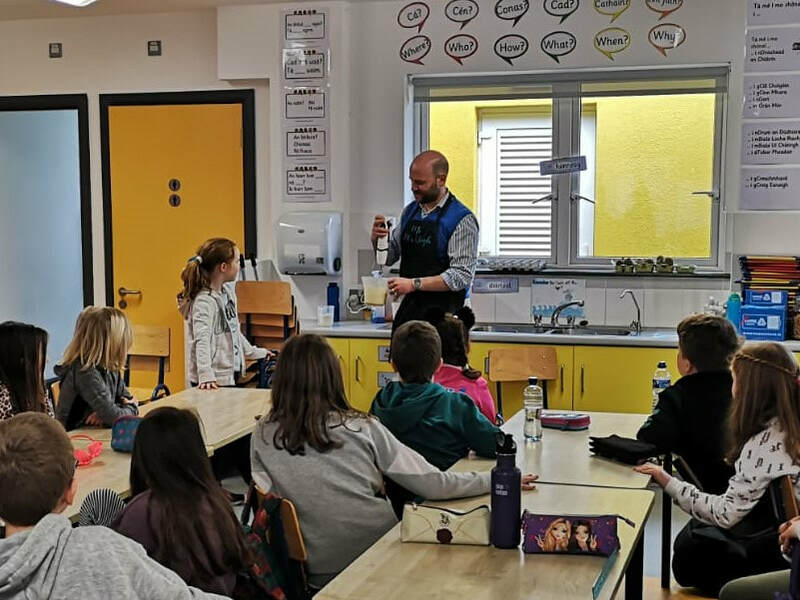 We had a visit from Tony, a dental technician. He showed us dentures and we used plaque tablets to see plaque on our teeth! We celebrated Burns Night on the 26th January. We acted out a Robert Burns poem, sang a Scottish song and made our own tartan patterns. Thank you to Avatal for sharing her knowledge and enthusiasm with the class. The children engages in map work and then drew aerial view maps of our school! Testing our reaction speed to a falling weighted scale. The children play soccer with a twist! Rinne na páistí pictúirí a thaispeáint na héadaí is fearr leo. Bhí na paistí ag foghlaim faoi éadaí- Féach ar na héadaí sin! 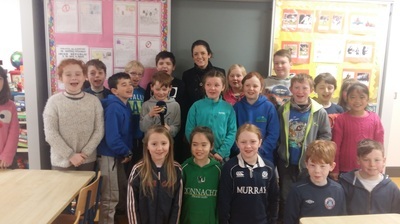 Firefighters from Gort fire station talked to the class about fire safety. 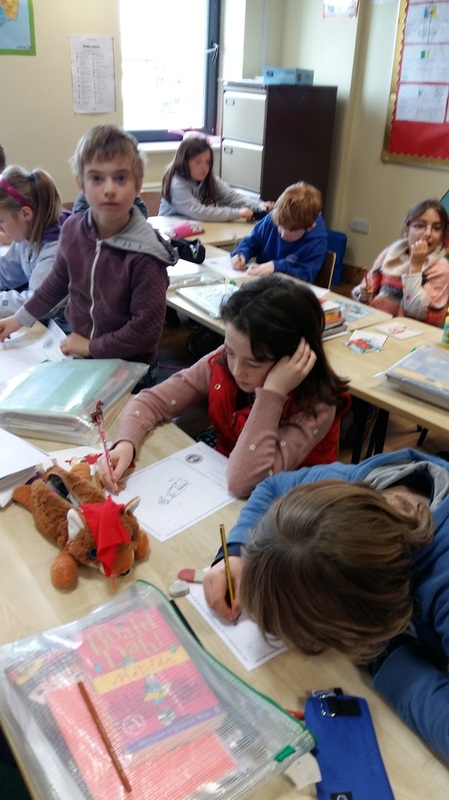 Taking part in a maths trail with senior infants. Practising our balance in Science! We designed our Winter cards, we can't wait to see them printed with our names on them. A big thank you to Sue who helped us with our designs, we love having visitors! 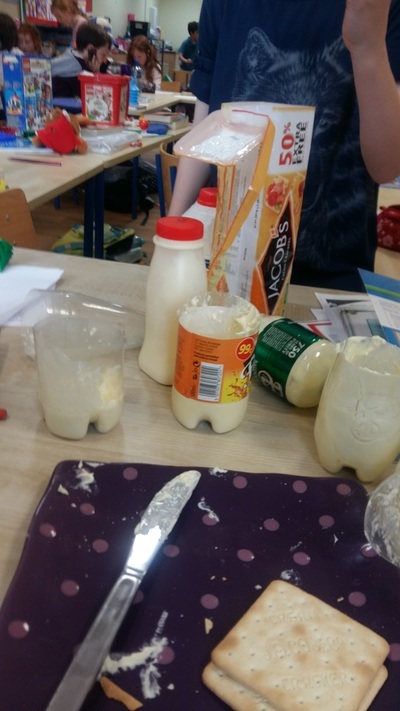 Making butter in Science. We are learning about materials and change. 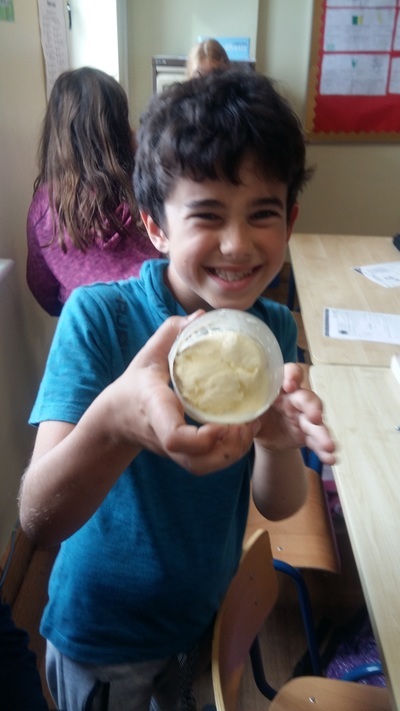 When a force is applied to a liquid cream, it can be turned into a smooth butter. 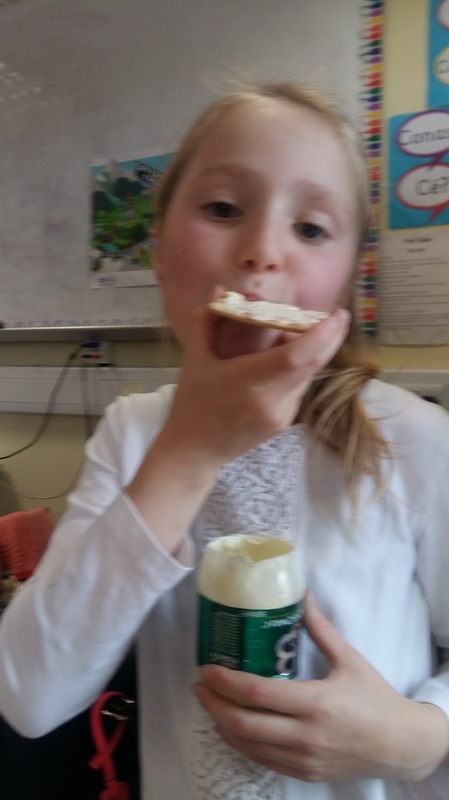 We ate the butter on crackers, yum! Fáilte Romhaibh chuig Rang a Trí! We had a great time at Babaró. 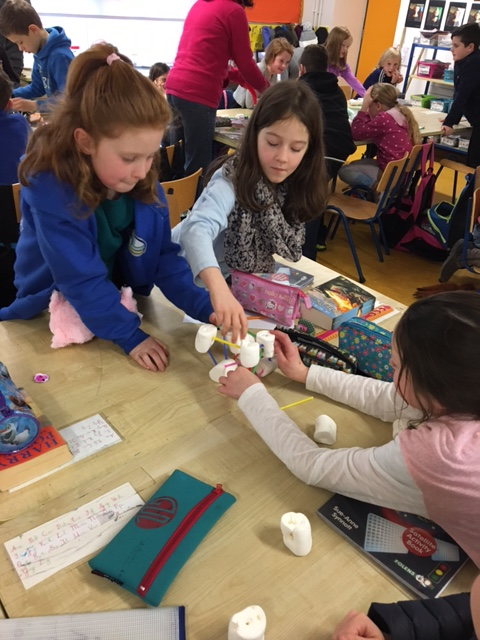 We attended Paper World in "The Black Box" in Galway. 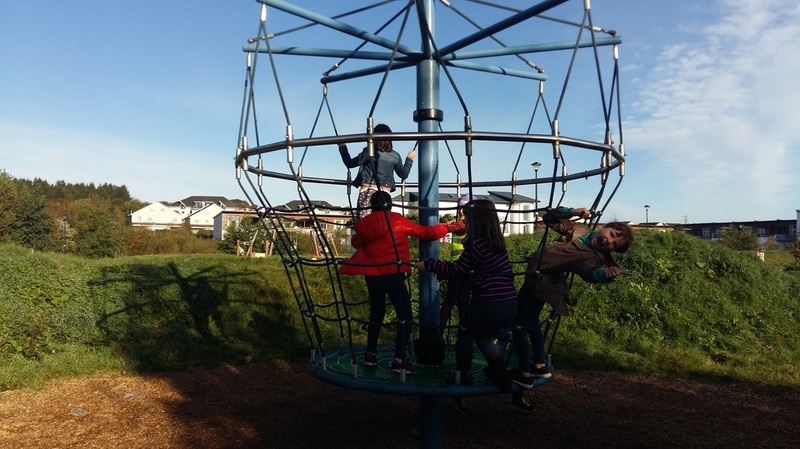 We also had a stop off at Doughiska playground! 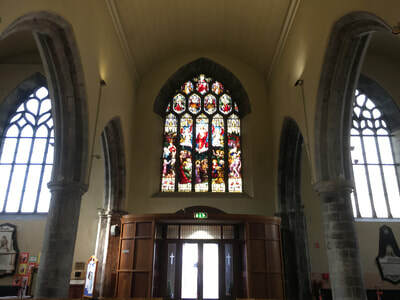 We also visited Galway City Library.